Although I am a purist when it comes to making traditional recipes, I love to create new dishes using the same ingredients. So I was very happy when one of the facebook groups I follow had an interesting cook-off, ‘same but different’. One of the weeks the challenge was to create a recipe using the ingredients of the classic Indian dish ‘Matar-Paneer'( cottage cheese with peas). So I set of to create a dish with peas & cottage cheese. My family is crazy about wasabi flavor and I always have wasabi paste in my pantry. 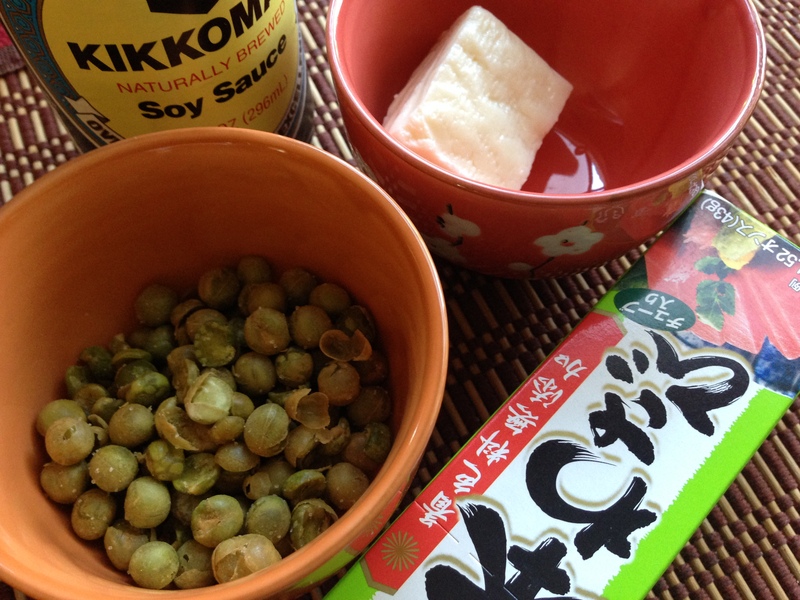 I also have roasted peas in my pantry but for this I decided to make my own wasabi peas, but you can use the readymade peas that you get in the market. 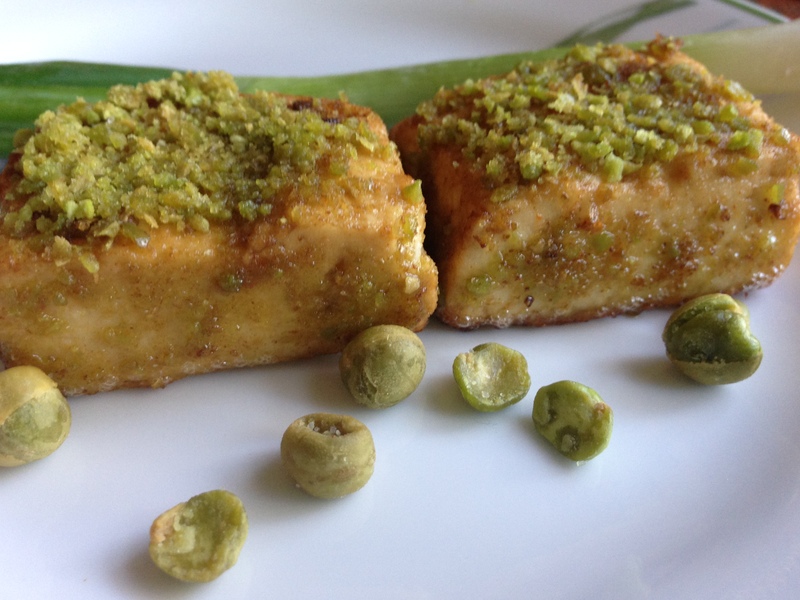 I will post the recipe for my ‘wasabi peas’ soon. Next came paneer. Although I used Panner for the cook-off as per the rule, I have made this with Extra Firm Tofu later on and turns out just as good . I like to season at each step along the way. 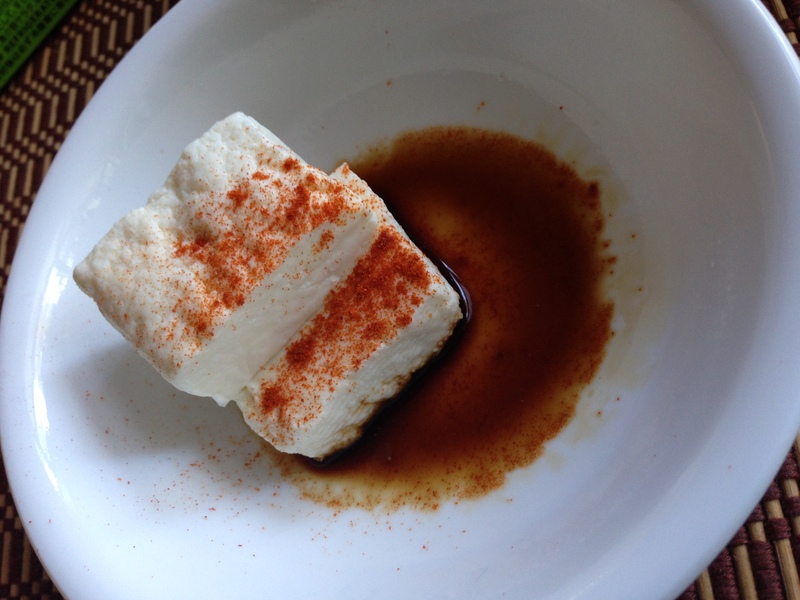 So the first seasoning for the paneer was some wasabi paste, sambal paste and some soy sauce. Let the paneer marinate for 30 mins. While the paneer is marinating, you can work on the broth. The broth I made is very gingery and I feel it goes well with the wasabi. Combine all the ingredients for the broth and let it simmer for 15 mins. Add the rice noodles and continue cooking till the noodles are cooked. While the broth is simmering you can now prepare the vegetables that go in the broth. 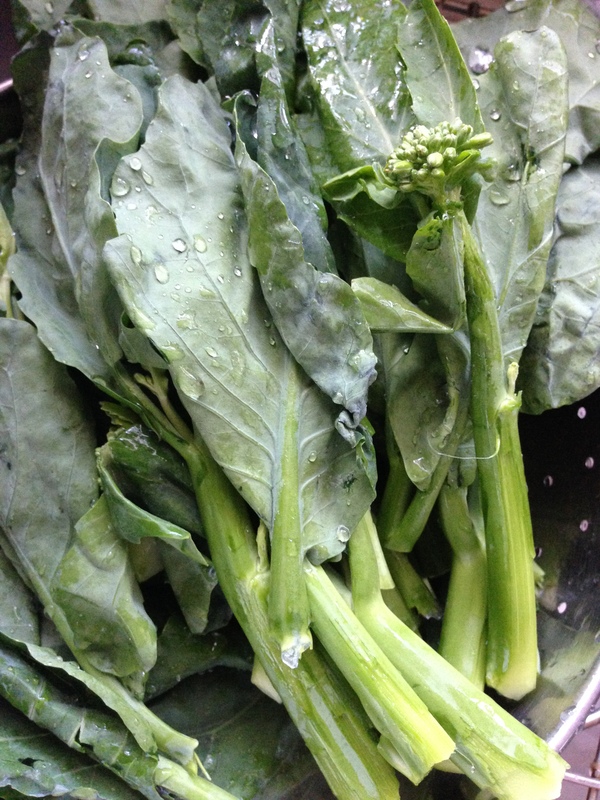 Here keeping with the mustardy taste and flavor, I have used Chinese broccoli. Saute garlic in heated oil. Add the broccoli and saute for a couple of minutes. Do not let it cook completely. I feel that it should have a nice bite to it, which tastes great in the broth. Now back to our paneer. Paneer will get pan fried. Let us take the wasabi peas and crush them to a coarse powder. 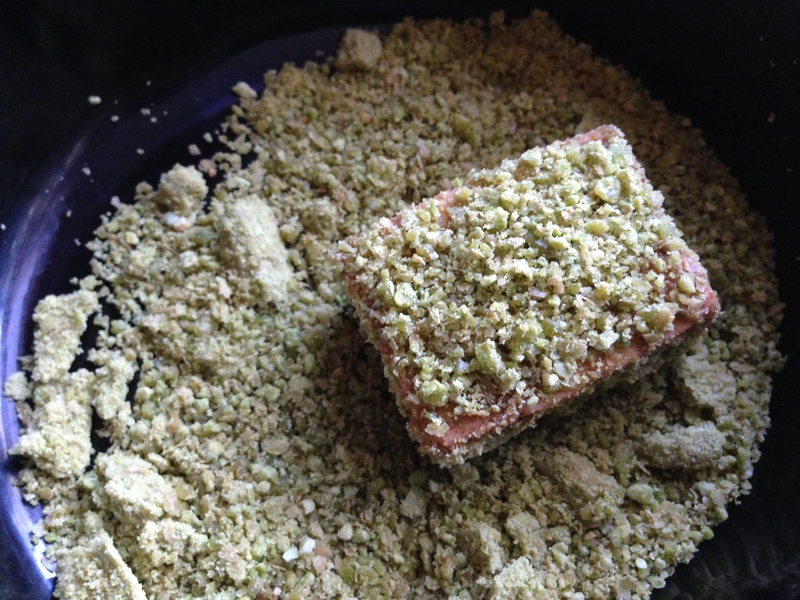 Now take the marinated paneer and dip it in the pea powder. 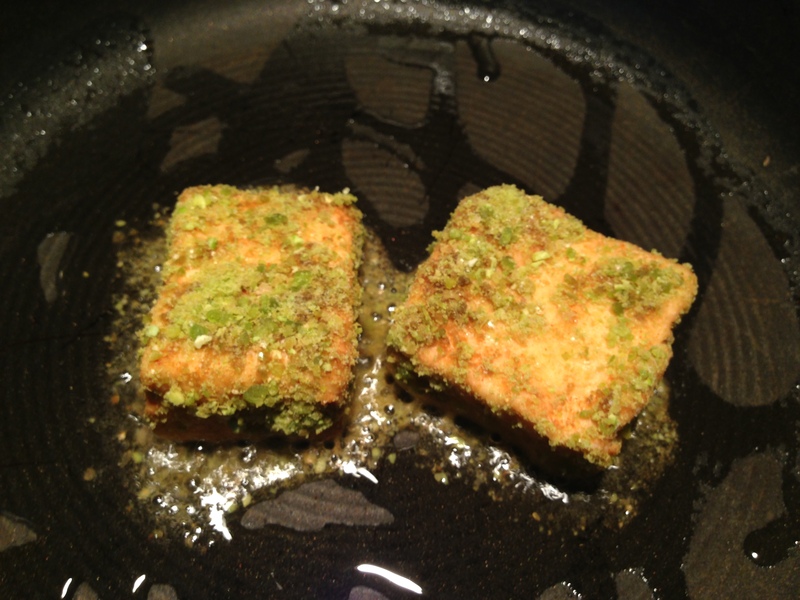 Now in an omelette pan shallow fry the paneer pieces till brown on either sides. You only want to turn these once so the coating stays on the paneer. Now the fun part. We are ready to serve the dish. 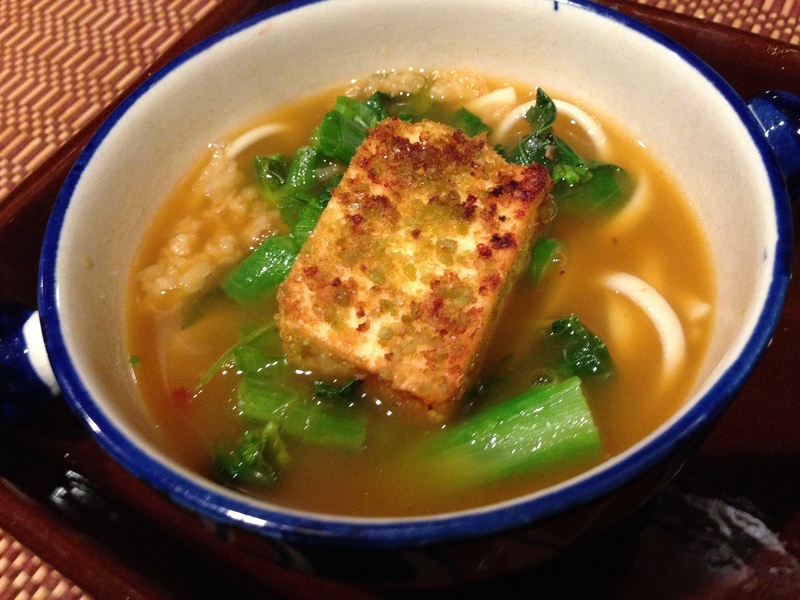 Pour the aromatic, spicy hot broth in a bowl. Add the sauted vegetables and top it with the paneer pieces.